Savute is a land of surprise and contrast. It has several geological features that show how the forces of nature are shaping the land over the millennia. The Savute area is located in the south western regions of the Chobe National Park and covers around 5000 square kilometers. The landscape of the Savute area has been shaped by age old geological events and this area of the Kalahari is still geologically active. The Savute Channel has a very erratic history, drying up flowing at the irregular intervals. The channel has flowed and dried up at various intervals. It dried up in 1981 and started flowing again in 2007, reaching its end in the Savute Marsh in 2010. This has changed the whole dynamic of the area from a barren land where wildlife concentrated around man made waterholes to a lush region. 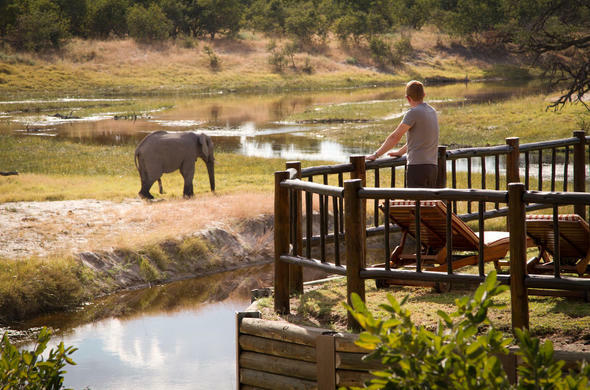 The wildlife may be more spread out, but Savute still provides a fascinating safari experience. One of the major things that the Savute is known for is its predator interaction, which has been the subject of many documentaries. The Lions are also famous for having learnt to hunt sub -adult Elephants. However with the changes that have occurred in the landscape over the past year, it is too early to tell how the wildlife will react to these changes. Despite this uncertainty, Savute remains a prime African Safari destination. In recent years the landscape has changed and with these the prides of Lions have since split into smaller groups, and there is less competition. These Lions were also famous for learning to hunt Elephants, although this is no longer commonly seen. The Savute Marsh area is in the Chobe National Park and therefore the only activity offered is game drives. There is an area higher up along the channel which is in a private concession, and here night drives are available for those wanting to experience the incredible nightlife of Savute. The unique history of the Savute channel has been discussed at length but it remains one of Botswana's most unique safari experiences. The Savute Marsh area has a fascinating collection of hills dotted on the landscape. Numerous interesting theories and stories have been built around these hills but aside from that they give the landscape of Savute an interesting appeal. Another unique feature of the Savute is that the channel flows from another river and ends up in the desert. When flowing, this life-giving artery of water in the Kalahari Desert attracts game from far and wide. Once, this region was part of the great Makgadikagadi Super- Lake which covered most of northern Botswana. This lake has created many features of the Savute landscape. One of which is the Magwikhwe Sand Ridge, which stretches for over 100km and is over 20 meters high. This ridge marks the ancient shore of the long vanished super lake. This ridge encircles the western edge of the Savute area. Another feature is the Mababe Depression, which is a low area of vast dry savannah plains that in years when the Savuti is in high flood, fills to form a vast and shallow lake. This area was once the bed of the vast shallow super lake. The Kalahari is known for being very flat and rather devoid of rocks, so hills are considered to be something special. There is a group of seven hills or rocky outcrops which are referred to as the Gubatsa Hills. These were formed due to volcanic activity and are over 980 million years old. They now only rise about 90m above the surrounding plains, but as they are the only piece of high ground for many miles, they look most impressive. These hills were islands during the time of the great super lake and you can see old pebble beaches at their base and the north-eastern faces of the hills have been worn into vertical cliffs by the action of the waves many years ago. The Savute area is also characterized by a whole forest of dead trees. These trees were killed off during one of the periods when the Savuti Channel flooded in the last century. All of these features tell the geological story of this dynamic area, and if you know what you are looking for you can read about the past events in the signs left in the landscape of the area.